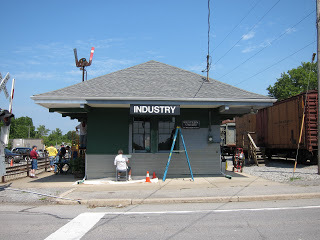 After many hours of hard work of scraping, sanding, and priming, the finish painting on the south end of our ex-Erie Railroad Industry, NY depot started in earnest on Saturday, August 14. With a crew of 6+ volunteers, the work progressed well throughout the day. The crew is well into the repainting just after lunch. This is looking north at the south end of the depot. NYS Route 251 is in the foreground. The tracks to the left are of the Livonia, Avon & Lakeville Railroad and the tracks to the right are the museum’s Industry yard. There is still much more to do including completing the work on the south end and starting the prep work on the north end, but here are some images from our R&GVRRM Flickr site of the work in progress and the results from day one of the repainting. And as always, we welcome new hands to come out and help us on projects like this. Click here for more information on volunteering. This entry was posted in Museum Blog and tagged erie railroad, museum, paint, rochester. Bookmark the permalink.